Welcome to the first issue of disAbility eNews for 2013. I hope you had a restful and enjoyable Christmas and New Year and are prepared for the year ahead. 2013 will be another significant year for people with disability as the first stage of the National Disability Insurance Scheme (NDIS) becomes real in our launch sites across the country. The progress we have achieved in delivering this important reform has been very positive – it was only 18 months ago that our government received the Productivity Commission’s final report into a long-term disability care and support scheme. To have reached a point where the NDIS is now a certainty for thousands of people with disability is a great outcome and is testament the hard work and effort of so many people. There is still a lot of work ahead of us and I look forward to continuing to progress this reform, including supporting our Australian Disability Enterprises to be NDIS-ready. Our Prime Minister, Julia Gillard is a strong supporter of the NDIS and has expressed that its introduction is one of her key priorities this year. Remember to visit the NDIS website so you can keep up to date and in touch with progress as we transform disability services in Australia. Thank you again for your contribution to improving the lives of people with disability and ensuring they have the same opportunity to fully take part in life as other Australians. I am delighted to announce today an additional $2.75 million Australian Government investment which will help Australian Disability Enterprises (ADEs) as they move toward the Australian Government’s vision for supported employment and a National Disability Insurance Scheme (NDIS). In May last year, the Australian Government released Inclusive Employment 2012 – 2022, A Vision for Supported Employment, which outlines a significant change over the next decade in the way we support people with disability in employment. This funding underpins the Vision and responds to a number of recommendations contained in a report prepared by the Australian Disability Enterprise Vision Advisory Group. contribution payments to assist ADEs in their transition to a social enterprise model and to develop new commercially viable business lines to meet market demand. This is in addition to the $1.2m investment to support older Australian Disability Enterprise workers transitioning to retirement announced in November last year and our $3.1 million commitment in early 2012. For more information on this announcement, please view the media release on my website. I am currently in South Korea supporting our Australian athletes at the 10th Special Olympics World Winter Games. It is an incredible achievement to represent your country and we wish them the very best at these Games. They have all proven that disability is no barrier to achieving. Visit the Special Olympics website to check out how our athletes are going. While in Korea, I will be addressing the first Global Development Summit: Ending the Cycle of Poverty and Exclusion for People with Intellectual Disabilities. The Summit will examine the needs of people with intellectual disabilities throughout the developing world. You can read more about the conference at the Special Olympics website. The New Year has also seen our successful Better Start for Children with Disability program expanded, with hundreds more children able to receive critical early intervention services and therapies. As a result of a $13.4 million boost by the Australian Government, from January 1 the eligibility criteria includes nine additional disabilities - Prader Willi, Williams, Angelman, Kabuki, Smith-Magenis, CHARGE, Cornelia de Lange and Cri du Chat syndromes and microcephaly. Around 1,200 extra children are expected to benefit from the expansion so I would like to encourage parents and carers to register their newly eligible children for Better Start. Families can receive early intervention funding of up to $12,000 - eligible children up to the age of six will receive a maximum of $6,000 per financial year to spend on early intervention services. We are extending these services to children diagnosed with other disabilities where there is strong evidence of the benefits of early intervention, so they can also get the best start in life. Better Start provides families with funding to access therapies such as speech therapy, audiology, occupational therapy, physiotherapy, optometry, psychology, orthoptics and services of teachers of the deaf. Read more in the media release on my website. Finally, following the Federal Court’s decision in relation to the Business Services Wage Assessment Tool (BSWAT) handed down late in December, the government is working through the detail and our next steps. Read more in this issue of disAbility eNews. We will keep you informed of developments as they occur. The Australian Charities and Not-for-profits Commission (ACNC) recently opened its doors as Australia’s first national, independent regulator of the not-for-profit (NFP) sector. The ACNC’s objectives are to maintain, protect and enhance public trust and confidence through increased accountability and transparency; to support and sustain a robust, vibrant, independent and innovative not-for-profit sector; The ACNC's reporting obligations are intended to promote transparency and accountability, while reducing, over time, reporting obligations of charities under other laws. To achieve this, the ACNC will work closely with Commonwealth and state and territory government departments and agencies to identify opportunities to streamline and reduce reporting to government. One of the key intended outcomes is for charities to report once to the ACNC and for authorised government agencies to access this information from the ACNC (the 'report-once, use-often' framework). While initially the ACNC will only regulate charities, in the future it may also regulate other not for profit organisations but not before 2014 at the earliest. The ACNC will register NFP organisations that are charities; help charities understand and meet their obligations through information, guidance, advice and other support; and establish a free, searchable register of charities. Through the register, anyone will be able to find out information about a charity they might want to donate money to or volunteer with. Visit the ACNC website for more information. The Department of Treasury (Treasury) recently released papers for public consultation on governance standards for the not-for-profit sector and proposed financial reporting regulations with comments sought by 15 February 2013. Treasury and the ACNC will be holding consultation sessions between 29 January and 13 February, visiting numerous venues around the country. Details of the sessions are available on the ACNC website. These consultations will be followed by regional briefings during the first half of 2013. For more information please visit the ACNC website. A joint Australian Human Rights Awards has been awarded to Australia’s four major cinema chains recently for work done to make their cinemas more accessible, through a systematic roll-out of technology. In 2010, Hoyts Cinemas, Village Cinemas, Event/Greater Union/ Birch Carroll & Coyle Cinemas and Reading Cinemas jointly announced an agreement with the Australian Government to introduce new audio description and closed captioning technology. This formed part of the Cinema Access Implementation Plan to improve cinema access for people who are deaf, blind, vision or hearing impaired. In the past, accessible cinema was limited to just a handful of sessions per week at major city locations, and sessions were often of the same movie for two or more weeks running and played at unpopular times of the day. Cinemas worked with the Australian Government and groups representing people with disability to draw up the Cinema Access Implementation Plan. The Accessible Cinema Advisory Group (ACAG), which includes the four cinema chains, motion picture distributors, the disability and media advocacy sectors and the Australian Human Rights Commission, was established to drive this work. Supported by an Australian Government investment of $470 000, ACAG has been working to a four-year schedule of installations that will provide technology to allow people with impaired hearing or vision to enjoy movies in more cinemas across Australia. The number of accessible screens to be available by the end of 2014 is 242. For further information on the Accessible Cinema Advisory Group’s work, visit the FaHCSIA website. On 21 December 2012, the Full Court of the Federal Court of Australia handed down its findings on an Appeal against a previous Federal Court decision, in favour of the Commonwealth, about the use of the BSWAT in determining pro-rata wages for supported employees. On Appeal, the Federal Court found in favour of the appellants, Elizabeth Nojin (on behalf of Michael Nojin) and Gordon Prior. The Commonwealth has moved to seek special leave in the High Court of Australia to appeal the Federal Court judgements. Thousands of people gathered at over 550 events across Australia last month to celebrate the 20th anniversary of International Day of People with Disability (IDPwD), held annually on 3 December. The Hon. Jenny Macklin, Minister for Families Housing, Community Services and Indigenous Affairs and the Parliamentary Secretary for Disability and Carers, Senator Jan McLucas, celebrated the day with students, staff and parents at Clifton Hill Primary School in Melbourne. As well as acknowledging the contributions people with disability make to our community, Ms Macklin thanked the organisers of the event, Children with Disability Australia and congratulated the school principal Geoffrey Warren on winning the ‘Excellence in Improving Education Outcomes’ Award at the National Disability Awards on 28 November 2012. “Clifton Hill Primary School is a great example of a school community that is fully inclusive of students with a disability,” Ms Macklin said. In her speech, Ms Macklin also recognised some key achievements made by Government over the last 12 months. “We’ve introduced legislation for the National Disability Insurance Scheme (NDIS) into Parliament and committed $1 billion to launch the scheme from the middle of next year, a commitment that will benefit more than 20,000,” she said. Other key achievements acknowledged on the day, were the expansion of the Better Start Program giving hundreds more children with disability access to early intervention services and therapies and the announcement of 73 recipients to share in the Government’s $10 million Practical Design Fund, funding projects that help people transition into an NDIS. See the full highlights on the IDPwD website. Social Traders together with the Faculty are currently conducting an online survey to better understand how corporate businesses are socially procuring. If your Australian Disability Enterprise or other social enterprises have contracts with a corporate that values your social mission, Social Traders would like them to participate in the research. You can do this by encouraging them to complete the survey or you can contact Social Traders at mark.daniels@socialtraders.com.au with a contact and they will follow up. Social Traders is a non-profit organisation established to support and encourage the establishment of commercially viable social enterprises throughout Australia. The Faculty is a procurement consulting business. For more information or to view the survey please visit the Survey Monkey website. It is important to keep your information up-to-date on the Australian Disability Enterprises website. The success of the website relies on the accuracy of the information provided to consumers. Keeping your contact details up-to-date is particularly important for ensuring you receive information on jobs logged through the 'Get a Quote' function on the website. To update details or create new listings please complete a website update form and email to the Australian Disability Enterprises mailbox. A suite of tools and resources to assist charities to comply with their obligations to the Australian Charities and Not-for-profits Commission (ACNC) are now available from the ACNC website. They include information about internal disputes, conflicts of interest, basic financial controls, holding your annual general meeting, choosing a new board member and disaster relief. 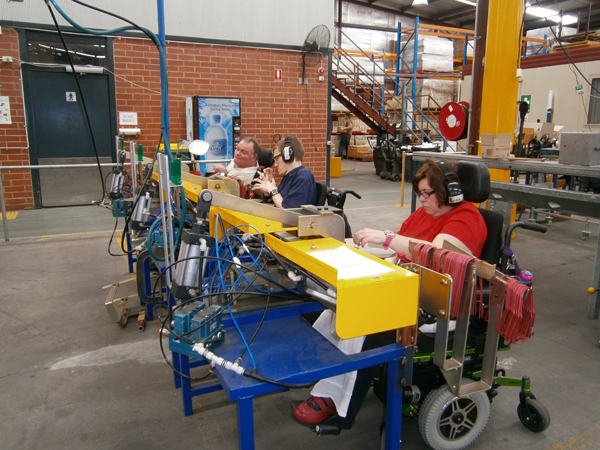 Goodwill Engineering, (part of the Centre for Cerebral Palsy) is an Australian Disability Enterprise that manufacture hardware and light engineering products. Located in Malaga, Western Australia, they employ 64 supported employees who work in an engineering environment specially tailored for people with disability including high support physical disabilities. Recently a number of supported employees expressed an interest through their workplace and workstation assessments in operating a wider variety of machinery. This initially presented a challenge for Goodwill staff as some of the machinery for manufacturing particular products wasn’t accessible for use by supported employees without acute fine and gross motor skills. From left: Goodwill Engineering’s supported employees Chris Milburn, Dylan Augustson and Angelina Vagliviello operating the new machines. To overcome this challenge the Occupational Therapist, services and trade staff, with the input of the supported employees, developed a prototype wire forming machine that supported employees with high physical support needs could use. The machine has very low barriers and low restrictions for use. Using the machine, supported employees have the opportunity to broaden the range of day-to-day tasks they can do. The supported employees now using the machines have all provided very positive feedback to staff about their experiences, with most saying that their work is more interesting due to the increased variety of tasks they can perform. Following the initial success of the prototype machine, Goodwill Engineering has built three more machines which are now operational and work has commenced on a further three which will soon be out on the factory floor. These machines are one step further to ensuring people who have high level physical disability are able to access the workplace, contribute to the workplace and be successful in their employment. Please visit the Goodwill Engineering website for more information. At the time of the Vision’s publication, the average hourly wage rate for workers with disability in supported employment was $3.65, which was less than 23 per cent of the national minimum wage. A snapshot today shows the average hourly rate has increased to $4.27 – a trend that needs to continue as progress is made towards the goals of the Vision and if good employment outcomes are to be achieved for people with disability in supported employment. The performance indicator ‘% of Supported Employees across all your Outlets where their annual average wage has increased by more than the percentage increase in Average Weekly Ordinary Time Earnings (AWOTE), or who already earn the national minimum wage’ has been included in each organisation’s funding agreement to promote increases in wages for supported employees in line with those of the general workforce. Individual or particular wage tools used will not be considered in measuring wage outcomes related to this indicator. AWOTE figures are released twice a year by the Australian Bureau of Statistics. It is the May full-time adult ordinary time earnings figure for the current financial year that will be used in the annual reporting against this measure. This means that reporting against this performance indicator will not be available until late August or early September of the following year, i.e. September 2013 for the 2012-13 financial year data. FaHCSIA staff will work with organisations to ensure appropriate and accurate information to enable progress against this performance indicator to be reported. Further information will be made available in future issues of disAbility eNews when confirmed. When returning a Suspended or Exited Case on FOFMS, you may receive the following error message. ‘You cannot save a disability case for this client as this client already has another disability case in the system. Please contact FACS for assistance’. This error indicates there is another Case on FOFMS for this Supported Employee. You will need to contact the Case Based Funding Helpdesk. They will check there are no other active Cases for the client and then process your return from suspension request. This process ensures that there is only one active Case on FOFMS for the client and prevents dual funding. If you receive this error message, please email the Case Based Funding Helpdesk, quoting the Case ID and provide a Status Change Reason. You can temporarily exceed your outlet capacity to assist a supported employee returning from Suspension or Exit by utilising Stretch Capacity. Stretch Capacity is a 10 per cent allowance on top of your Outlet Capacity. Stretch Capacity places are utilised when your organisation has no vacancies and a supported employee who has previously been Suspended or Exited from your Australian Disability Enterprise wishes to return to work. The case will take up a Stretch Capacity place only while there is no outlet place available. When another case is Exited or Suspended, this frees up an outlet place and the case in Stretch moves over. To access Stretch Capacity your Disability Enterprise outlet must be at full capacity. You must also return a supported employee’s case from Suspended or Exited status within 12 months from when the supported employee was Suspended or Exited. If the supported employee Exited your Australian Disability Enterprise to access open employment then the period for their return to is two years. You will need to contact the Case Based Funding Helpdesk for assistance with returning these cases. Stretch Capacity places cannot be used for new supported employees who have not previously been supported by your Australian Disability Enterprise. If you have any further queries regarding your outlet’s Stretch Capacity please email the Case Based Funding Helpdesk.